I have a tortoise.his name is Jared! he is a greek. he is very curious! he always loves to chase our foots and bite them!!! he is also very very fast!!! Your Video of Jared is so cute. I own 4 Greek tortoises and can truly say they have never tried to bite me. They are the sweetest Tortoises I own. They crawl up to me and fall asleep beside me. I even have one that sleeps on my shoulder when I'm laying in the sun. 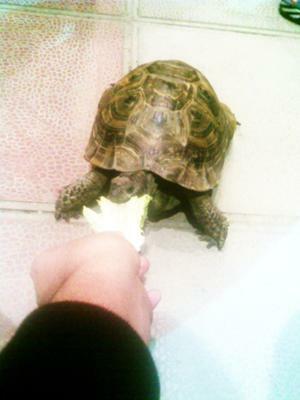 I have 3 Russian Tortoises as well and they are another matter. They will and have bitten me and my dog. Its not often, but I've learned to watch my fingers when I feed them by hand. Thank-you for your lovely story about Jared! I think many people are surprised by how quickly a tortoise can move. I hope you have many happy years with Jared. Keep is slow and steady.